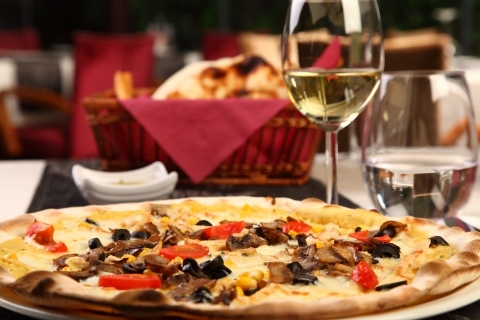 Pizza in Santa Fe: Need Help With Choosing a Wine For Pizza Night? 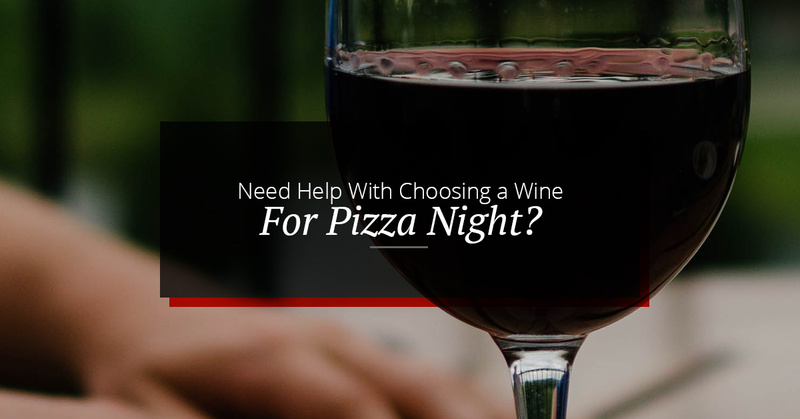 Need Help With Choosing a Wine For Pizza Night? There are two varieties of people in this world: those who drink beer with pizza, and those who drink wine with pizza. There are also people who don’t eat pizza, but not many. In a previous post, we discussed the range of beers that taste great with our pizzas, like an American Pale Ale with a Margherita or Belgian beer with sausage and mushroom. Now we will cater to wine connoisseurs and lovers of the grape. 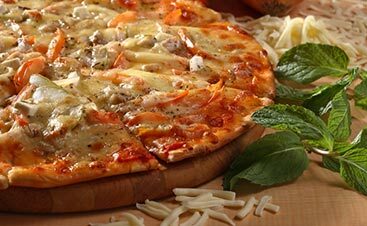 If you’re looking for a great night of crusty pizza, incredible wines (or beers), and a feeling of being around family, come to Upper Crust Pizza for dinner (or lunch). 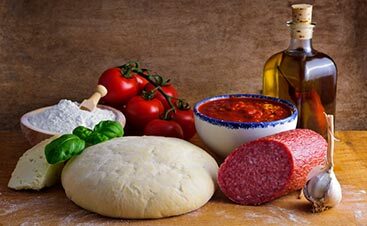 Before we slice into which wines are the best for different varieties of pizza, it helps to know a little about pairing food and wine first. When you break it down, there are six basic flavor profiles that you want to look for in both the food and the wine. Acidic wine works well with fatty and sweet flavored foods. Fatty foods should be paired with an acidic wine or one with a high alcohol content to add a robust flavor. Bitter or tannic wine should be balanced with a sweet food. Salty foods should pair with a non-acidic wine to keep that distinct flavor. Sweet foods and wines can be balanced out with a little acidity. Alcohol will match the powerful flavor in fatty foods and balance out the sweeter foods. Have you started drooling just thinking about pepperoni pizza? 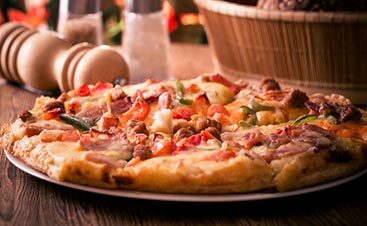 The perfect circle of beef, pork, cayenne, pepper, garlic powder, and other spices manages to invade each bite of pizza with the fattiness. You want a wine that will hold up to this immense and savory flavor. Try a deep red wine like Sangiovese that has a high acidity, high tannins, and will match well with the meat. A Cabernet is also a great choice. With a fresh tomato sauce, light and crusty dough, you need a light and fruity wine. Red wine lovers may not be satisfied with this wine pairing, but that doesn’t mean it’s any less balanced and crisp. The pairing? Pinot grigio. Choose a variety that is on the dry and fruity end rather than dry and minerally. The problem with this type of wine is that it can also be on the sweet end and too fruity. Give yourself some time in the wine aisle to read the labels and ask the clerk for recommendations and if you must, grab more than one bottle! If you really want to stay away from white wine, try a lighter, less tannic red wine, like pinot noir. The bold flavor of sausage includes spices like fennel, thyme, and oregano. To match these profiles, a strong, bold wine is needed. A favorite pairing for this type of pizza is syrah, which has a range of flavors depending on where the grape was grown, from olive to blackberry. Since sausage is commonly partnered with mushrooms or peppers on a pizza, it’s best to choose a light to medium syrah that isn’t too strong and will throw off the balance. The delicate and smooth flavors of wine can be scary and even be confusing for some. But you have your favorite pizza, right? One that you always order. Think about what makes up that pizza — is it sweet or fatty? Play around with different wines and you’ll find your favorite wine pairing. To experiment, come to Upper Crust Pizza in Santa Fe.